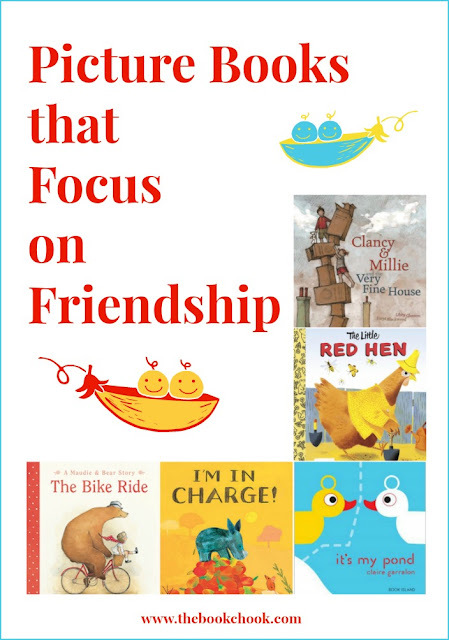 Here are some new reviews of picture books I love that focus on friendship. Below you will find a list of more children’s picture books with this theme. I'll be adding to this list over time. Meet Maudie, a plucky young girl, and her friend Bear, a gentle giant with a heart of gold. In The Bike Ride Maudie’s endless planning is as tiring as the bike ride itself. This is a great little story in board book format about two friends: Maudie and Bear. Ormerod’s simple text leaves space for Blackwood’s sub-text in the beautiful illustrations. Oh Maudie! We all have a friend like you. One who drives us crazy but whom we love just the same. Maudie suggests a bike ride and Bear waits patiently while she goes back for bug spray, hats, sunglasses. Maudie proclaims that exercise is good for you, and we see poor patient Bear is the one who must ride the bike uphill, while Maudie dangles her legs from the basket on the handlebars. Look out for other stories in the Maudie and Bear series. Two new neighbours playing ‘Three Little Pigs’ discover that friends are what make a house a home… Clancy has just moved house. He is missing his old house terribly - the new house is much too big and much too lonely. How will he ever make it his home? As despair takes hold Clancy hears a small voice. Soon, Clancy with the help of his new friend Millie is building towers to the sky and trains to the street outside, and together they build the home that Clancy thought he had lost forever. ‘I love my new home,’ says Clancy’s mother. ‘It’s the best house.’ ‘It’s a very fine dwelling,’ says Clancy’s father. ‘It’s too big,’ whispers Clancy. There’s so much to appreciate about this gorgeous children’s picture book from two of our most beloved creators. For a start, it realistically portrays a friendship between two kids. I love the way Gleeson, with not one extraneous word, presents the play scene between Clancy and Millie. The dialogue is spot-on, and the playing ebbs and flows naturally, just as in real life. It’s great for young kids who are uprooted from a familiar place to be able to read a story about Clancy, who has been there too. Blackwood’s illustrations are energetic, colourful, textured. She helps us understand the children’s points of view by showing us things from their perspectives. For instance, when Clancy tours his new house, it seems cold, huge, far from the cosiness he’s accustomed to. When the children build an higgledy-piggledy cardboard house, it’s just as enormous and crazy as their imaginations would have it. I love that this book celebrates not just friendship, hugely important though that is, but also imagination and play. The children develop a friendship through play, through collaboration, through turn-taking and the give and take of undertaking a project. None of it is over-done, and the final scene is immensely satisfying. I’m in Charge: written by by Jeanne Willis, illustrated by Peter Jarvis and published by Nosy Crow (Allen and Unwin in Australia) (2017.) RRP: $Au 24.99 HB. This romping rhyming story from award-winning author Jeanne Willis is all about a little rhino who likes to make the rules! When Rhino finds a tree bursting with fruit, he isn't about to share it with anyone - after all, he's in charge round here! But it looks like things are about to change... With brilliant illustrations from Jarvis, this hilarious toddler-tantrum tale is all about being bossy and learning to listen to others. Jarvis’s illustrations are exuberant, colourful and dramatic, really enhancing the tension and adding to the energy of a great read-aloud for kids. The lesson is clear but not preachy, and kids will love pointing out where Rhino went wrong. It’s very tempting, especially for kids, to focus solely on ownership of something. Grown-ups can be like this too. Some of us build walls to keep a place all to ourselves, or keep our possessions in a bank vault where nobody can see them. Many children will understand the concept of dividing a place up so each duck can guard his equal part, and I think they will make the connection when a black duck suggests they forget about focussing on ownership and concentrate on swimming and having fun. But then, along comes a hippo… and then another …The last page - an empty pond - is quite enigmatic and will make kids wonder. What happened to the hippos? Did they learn to share? Did they understand the pond is for everyone? Did they leave? I love the gorgeous simple and clear illustrations Garralon gives us in It’s My Pond. The ducks themselves are not realistic but more like toys. There are no detailed backgrounds, just a bright blue pond on a stark white background. The striking cover will have children clamouring for the book, and I hope it will plant a seed of unselfishness in them, and a better understanding of how to be a friend. Little Red Hen is a classic but also a friendship-themed story where the message is not as positive as it is in Clancy and Millie and the Very Fine House or The Bike Ride. Little Red Hen asks all her friends to help her, and they all decline. When it’s time to eat the bread she’s made, they suddenly all want in but Little Red Hen declines. Kids will work out for themselves that being a friend is about sharing and sharing is about helping out all the time, not just when it suits you. My review is here. In the list below you’ll find many more children’s picture books that have a focus on friendship.